A Jillian Vance Design: Merry Christmas... in July!! Happy Wednesday A Jillian Vance Design fans!! Rosemary here on the blog today. As you may have noticed Bunny has been sharing some lovely Christmas cards using some of the new products to be found in the AJVD store. I decided to get in on the Christmas spirit and created a quick and easy card using the AJVD stamp set Pine Branches. 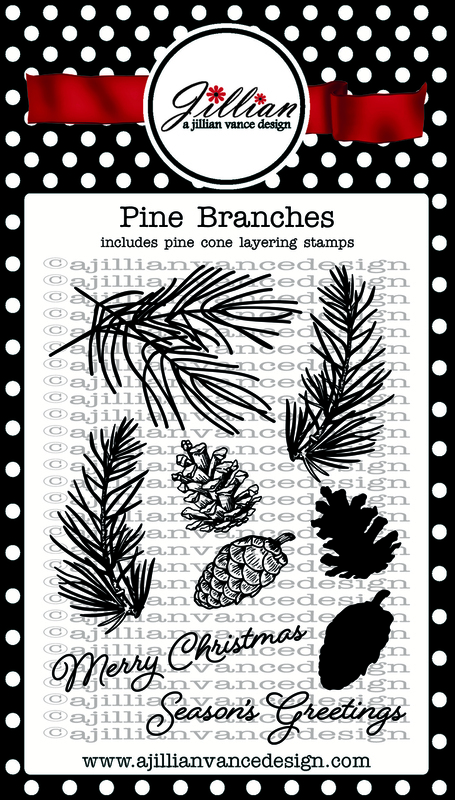 The Pine Branches set has two different pinecone images that are designed for two-step stamping. Ink up the solid image in a lighter shade of ink and then the top layer in a darker shade to create the perfect pinecone. 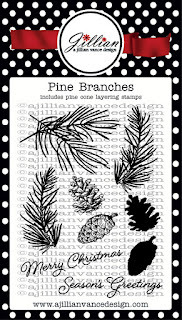 I stamped the pine branch using a dark green ink and then the pinecones in kraft and medium brown inks. Once the pinecones were stamped I over stamped then with VersaMark ink, applied some iridescent embossing powder and then heat set. The subtle sparkle is pretty in real life. Unfortunately you can't see it in the photo. 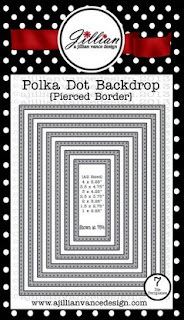 Once I had all the stamping done I die cut my cardstock with a Polka Dot Rectangle backdrop die and then added a bow tied from some red grosgrain ribbon. I stamped a third pinecone (following the steps above) on some white scrap paper, trimmed it out and then adhered it as you see. The sentiment from the Pine Branches set was stamped in a red ink that matches the grosgrain ribbon and the panel was adhered to a hunter green card base. You've done it again, Rosemary--a fabulous card! 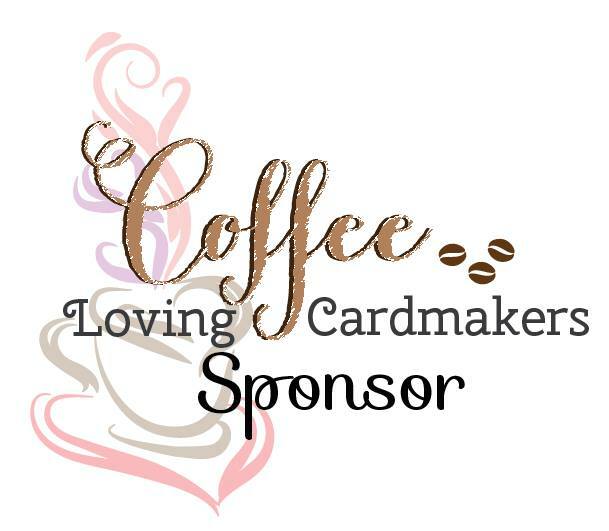 The big red bow is wonderful over your perfect stamping & I love the one pinecone popped up! Thanks for always inspiring me! Holy smokes Rosemary, this is incredible!! Love your lush red bow and the depth you achieved with the pinecones. They look so real!! I was just looking at this stamp the other day in my stash. 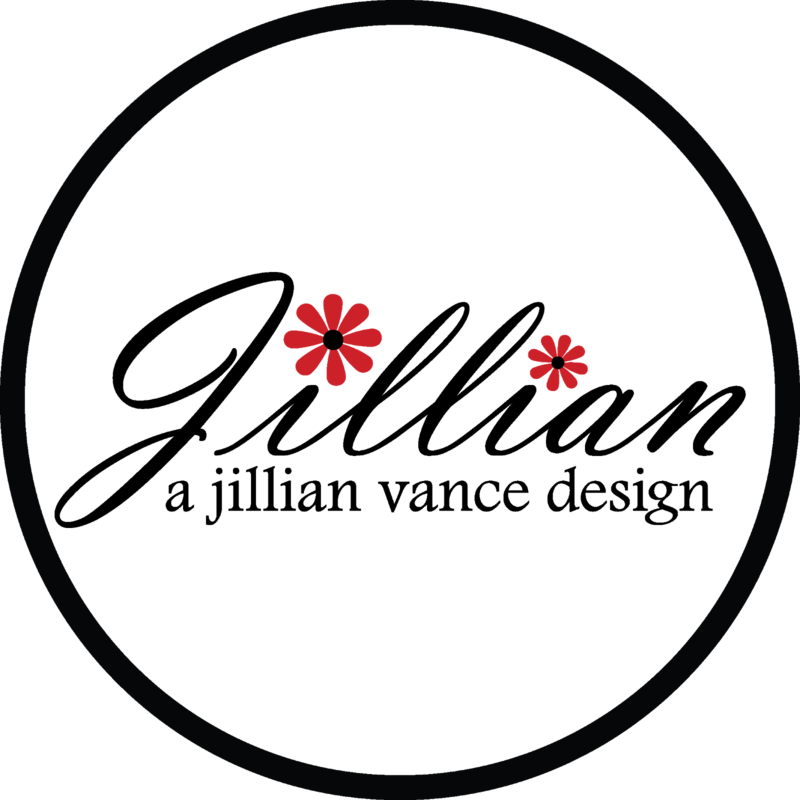 Love that big red bow Rosi and how you popped up the one pine cone. Love this. OH, Rosemary, what a GORGEOUS card this is!